Typically, when we hear PTSD, Post-Traumatic Stress Disorder, we think of military veterans who experience vivid and often debilitating panic-inducing flashbacks of their time at war. Here are some other common causes of post-traumatic stress disorder and how to cope. 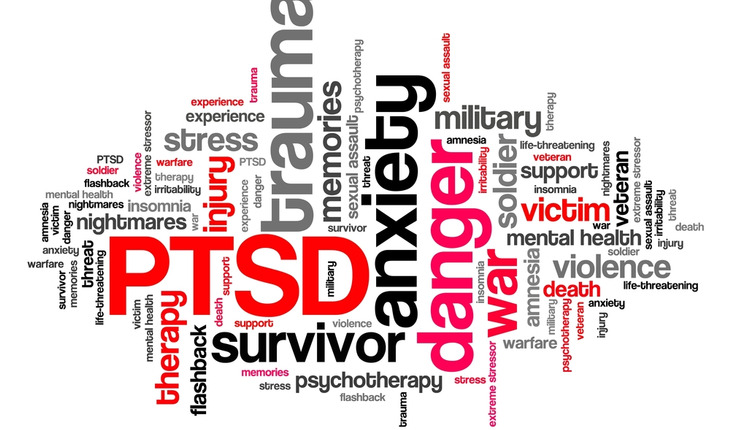 Typical symptoms of PTSD include distressing nightmares that awaken you in a state of panic, persistent thoughts and recurring flashbacks about the traumatic experience, numbing or avoidance of memories of the trauma, triggered emotional responses and just an overall on-edge feeling. Anyone can have PTSD symptoms and often poeple may feel judged for not being able to shake off something others may perceive as not being a big trauma. Many people suffer in silence. One quarter of the population will be involved in automobile accidents that result in serious injuries. For those who come seeking mental health treatment after a car accident, 60 percent are diagnosed with PTSD. It’s quite common. Symptoms may include feelings of anxiety, increased heart rate, and a fear of driving or even being a passenger in a car. Often people who were injured in a car accident or even perhaps witnessed a fatality will be in shock. Then over time they begin to replay the accident. This is when it’s advised to seek therapy to cope with this trauma. As stated earlier, PTSD is commonly associated with combat veterans with 31% diagnosed. Combat PTSD symptoms can include carrying a weapon when not necessary, seeing threats where none exist, and outbursts of physical violence. Having these symptoms just means that you are having a reaction of stress to a nearly impossible situation. Service animals and emotional support pets are a start. Meeting with a PTSD specialist for therapy along with self-calming activities such as meditation, deep breathing, painting or yoga are recommended. Sexual assault, mugging or robbery are life-threatening situations that can instantly trigger post-traumatic stress disorder. When events like these occur, victims will try to avoid reminders of the trauma, always be on guard, and may have problems in daily living. People who went through assault often report feeling unsafe and on edge as if they are expecting someone to attack them again. They also experience terrible flashbacks with disturbed sleep. Turning to alcohol or drugs isn’t uncommon, which is why it’s so important to seek therapy. Group therapy could be very helpful because there’s comfort in not feeling alone. Natural disasters cannot be controlled, which makes it more difficult to prevent the anticipatory anxiety. Devastating life altering events such as tornadoes, earthquakes, hurricanes, and fires often put people into a survival mode for up to 18 months, studies show. Symptoms usually peak during the first year and in most cases, survivors get better with time once they have accepted the reality of the event. When we look at natural disasters that result in loss of lives, assets, and personal property, there’s a sense of hopelessness that can be incredibly overwhelming. The best way to deal with this situation is through therapy, which is often difficult to receive right away given people get displaced and are focused on basic survival. Emotional abuse is an attempt to control. It’s more about manipulation through put downs, name calling, blame shifting, instilling fear through ultimatum and threats, and making the person question his or her recollection of conversations and events. Typically, there is an overstepping of boundaries and the person has the feeling of walking on eggshells. Every decision comes with doubt and anxiety as whatever the person chooses may upset the abuser. Usually the PTSD begins after the relationship has ended or in the case of emotionally abusive parents, when the child leaves the home. The abused may feel depressed and fearful of being manipulated without knowing it. Helping people establish firm healthy boundaries and identifying “red flags,” empowers the victim. Emotional abuse is particularly insidious in that it feeds off the vulnerabilities and insecurities of its victims.